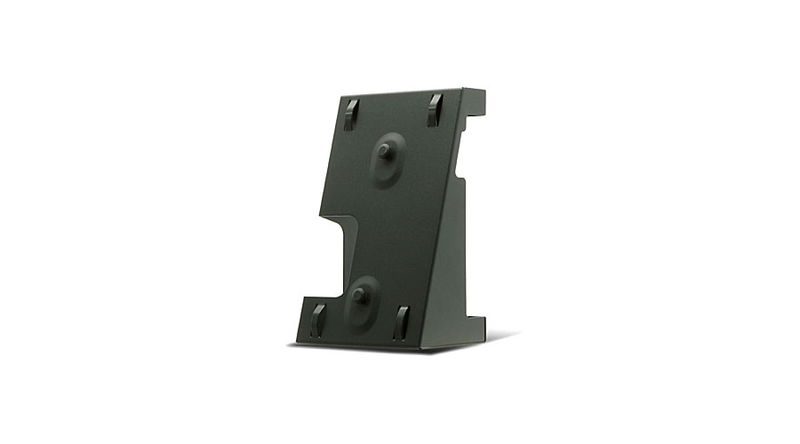 The Cisco mounting bracket (MB100) is specifically designed for all Cisco SPA9XX and SPA5XX Series IP Phones enabling the phone to be mounted on a wall. The mounting bracket quickly attaches the phone in place by aligning the two holes located on the back of the phone and sliding it onto the cleats on the mounting bracket. The durable all-steel construction of the mounting bracket is fashioned with a built-in tray permitting an optional Wi-Fi (WBP54G) or Power over Ethernet (POES5) dongle to be conveniently tucked out of the way behind the phone. Two screws secure the mounting bracket and phone on the wall.